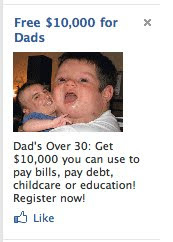 Here's one of the advertisements I recently found on my Facebook profile page. What the hell is this all about?! The image is enough to make you crap your britches in fear. Isn't that Sarah Palin's youngest kid?